This capacious home wine cellar, the GE Monogram Wine Vault is for those dedicated wine collectors who have a wine collection nearing 1000 bottles, have space in their homes for a walk-in wine cellar, and last but not least have the budget to invest in this high-end wine storage unit. But those who already have money to grow a wine collection of a considerable size wouldn’t regret investing in a highly-advanced residential wine cellar to preserve the quality of their precious wines. make the GE Monogram wine vault a top-notch walk-in wine cellar that will satisfy the needs of many serious wine collectors. This is not only a functional item for storing wines but a source of recreation and enetertainment. How about holding wine tasting parties for friends and family members? Your guest will envy you for your in-home wine cellar and will crave one for themselves. If not for rousing envy in your friends than the satisfaction you’ll feel when browsing your wine collection organized neatly on the beautiful redwood racking is worth considering buying a GE Monogram wine vault. This spacious wine cellar by GE Monogram can be installed freestanding or built-in. It’s a perfect addition to a recreation room or a bar area. Read a review on the GE monogram wine vault to find out its strengths and weaknesses (if there’re any) and to decide whether it’s the perfect home wine storage unit you are looking for. 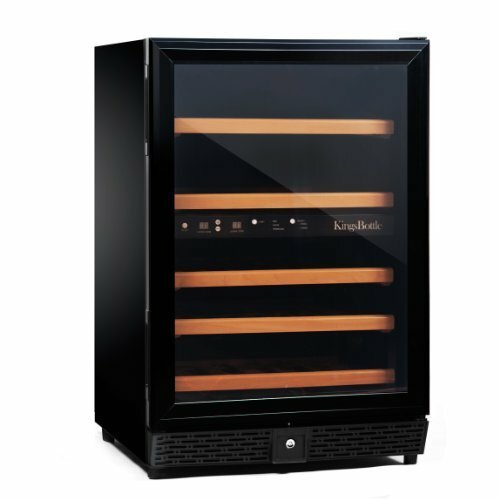 These modern self-contained wine cellars are assembled in your home by professional people. First of all make sure you check whether you have enough room to install the wine vault. To give you an idea of its size: it fits into a 8.95 x 11.95 foot space (perfect to be placed in an unused room). In the GE Monogram walk-in wine vault models you can store slightly more than 1000 bottles of wine. 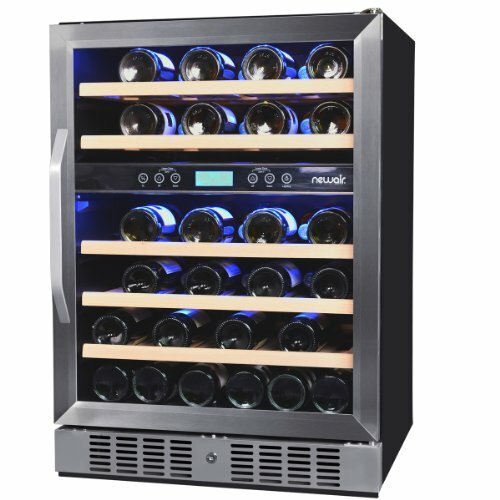 The cabinet consists of sturdy 304 stainless steel walls that contains high-density foam insulation (R33 insulation factor) to ensure constant temperature inside the wine room. The door can be locked to prevent unwanted access to your valuable wines. The unit comes with two keys. There’s an inside door release system that prevents anyone getting locked into the wine vault by accident. The racking system of the GE Monogram wine vault is made from moisture-resistant redwood and is designed to ensure optimal air circulation. Do not stain the redwood because it causes unpleasant odor in the cellar and prevents the wood rack from natural breathing. The natural light color of the redwood will darken as it ages. You can customize the tile of your wine vault with hardwood, tile, cork or stone to create an overall atmosphere that suits your taste the best. Storage rack (model ZWVS1000SR) for those who want to utilize the maximum storage capacity of 1070 bottles. The racks are arranged to hold single layer, double or triple layer of bottles, as well as crates. The diamond shape bins are designed to accommodate various bottle sizes and shapes. The angled divider slot in the middle can be removed to make room for bulk storage. There’s a customizable wine tasting station with inlaid cork tabletop, a removable storage drawer for corkscrews and other utensils, 6 display or storage shelves designed to hold a case or up to 15 bottles at the back of the vault. The angled racks here hold the bottles at 12º providing a spectaular showcase of your most prized wines. The racks have engraved metal plates with numbers and letters to help you find and access wines. The 3000 BTU digital cooling system is able to cool max. 30 ºF cooler than the ambient temperature. To turn On/Off the cooling system you have to press the power switch of the unit. When you turn it on for first the first time there’ll be 5 minutes safety delay. On the temperature display a red LED light will light up beside WINE to indicate that the cooling process has started. After 5 minues the red LED light beside ON will light up. 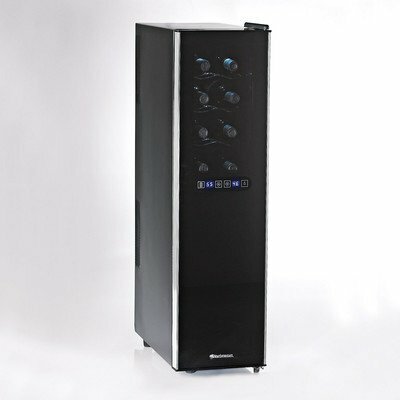 The cooling unit will gently cool the wines instead of rapid chilling. The wine vault requires cc. 48 – 120 hours for he set temperature to stabilize. There’s a Condensate Evaporator Switch which in ON position activates the heating element to evaporate the water in the condensate pan. This also helps to maintain relative humidity level inside the wne vault. In dry climates water may not be accummulated all the time so you can set the Condensate Evaporator to Auto position which will start the heating element at regular intervals to evaporate excess water in the pan. This will save electricity because the heating element will operate only occasionally. In areas where climate is more humid the condensate evaporator switch should be kept in the On position. The liquid-based digital thermostat senses the temperature of the wine inside the bottle thus provides very accurate temperature control. It is a temperature probe stuck into water in a bottle within the vault. The cooling unit is set to 55ºF in the factory which is the ideal temperature for long term storage of wines. Pressing the SET button will display the set temperature (the factory-set 55ºF). To increase or decrease the temperature press and hold the SET button and press either the UP or Down arrow to reach the desired temperature. The built-in Defrost System prevents frost ccummulation inside the vault. The digital temperature display is mounted on the exterior of the wine vault, next to the door. It shows the temperature of air surrounding the wine bottles in the vault. There’s a dry temperature probe for monitoting the ambient air tempearture. Weave the dry probe along the back of the racks so that the probe end is located about 12 slots from the front wall. The two temperatures indicated in the digital display and in the liquid temperature probe may differ from one another up to 10 degrees. The fluctuation in the air temperature depends on the number of times the door is opened and how long you leave it open. If you want to know the accurate temperature of the wine always look at the liquid probe temperature readout. 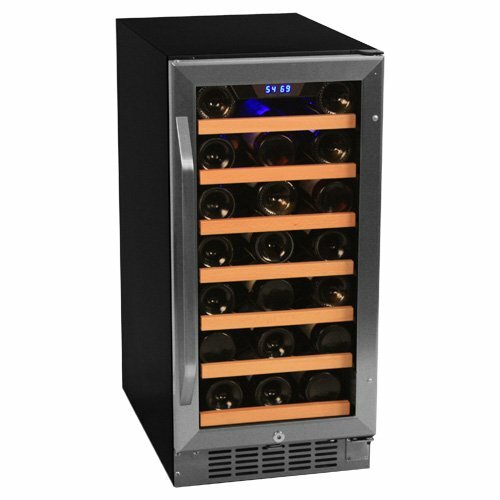 This advanced yet easy-to-operate system allows you to keep an organized inventory of your wine collection. The system comes with preprogrammed information about thousands of wines from all around the world. You can track individual bottles by country, producer, varietal, appellation, designation, vintage, price and maturity. You can enter data about wines that aren’t stored in the system. The software will track the maturity of wines and you can easily pick ones that matured and ready for tasting. Color Touch Screen Console – an easy-to-read 15″ color monitor showing the Cellar Management System Data. It’s equipedd with screen saver that activates after 6 minutes of no activity. Thermal Lable Printer – it prints barcoded inventory labels with important information on every bottle that you can fix to the bottles. The label allows you to see the most important information of a wine at a glance. Scanner – scans bottles as they are removed to take them out of the inventory. Power Cord – connects to the wine vault’s power system. Ethernet Network Port – connects to your home computer. External USB Port – for backup purposes. Add bottles – enter a bottle of wine to the inventory system. Add any information displayed on the label. My cellar view – provides color-coded diagrams indicating bottles by color and maturity. Find bottles – the Bottle Lookup tool is the easiest and quickest way to locate a bottle of wine in the system. You can also search by keywords or wine details. Ceiling Lighting – low-voltage halogen lights mounted on the ceiling, can be turned on/off with the light switch on the control panel next to the door. Rope Lighting – (on models with tasting racks -model ZWVT1000SR- only) concealed behind the rack fronts to provide discreet illumination, can be turned on/off with the switch on the control panel next to the door. The bulbs in the rope light strands are long live ones and will likely never need replacing. In case a bulb or bulbs in a strand burn out you need to replace the whole strand. Dimensions (approx. ): Height: 90 1/4″, Width: 104 1/2″, Depth: 93″, it can be installed either freestanding or built-in. Price of the GE Monogram walk-in wine vault: cc. US$ 35,000 (cc. US$ 32.71-35.0 per bottle). See our main article about Walk-In Wine Cellars. 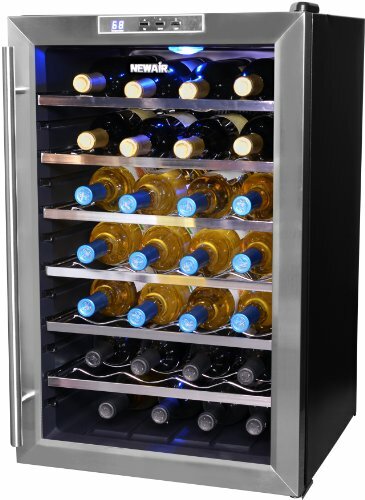 Take a look at GE Monogram Wine Coolers and Wine Refrigerators.